Prior to the founding of FISCAR in 2012, most of the historic marques that competed in the fifties had their own well established clubs. However, co-ordinating activities to attain really good grids of compatible and suitably competitive cars had proved to be somewhat difficult! The Fifties Sports Car Racing Club is not a substitute for those individual single marque clubs, but was established to complement their activities and pull all the strands together. The Team Racing concept, developed successfully over the last few years by enthusiast Mark Campbell, continues as a cornerstone of our ‘mission’. Many other series cater for cars of this period, but they also tend to include cars from the 1960s, or include cars that have “Out of Period modifications” . The Fifties Sports Car Racing Club main series are specifically for GT and production cars that raced in period and are still prepared to the same specifications. 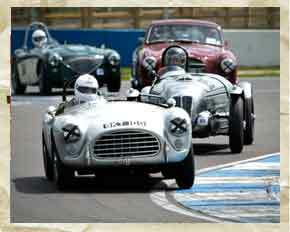 Our cars race on period rubber and are close to the way they were in their day. We host races at some of the leading Club racing events in the UK calendar, notably with the VSCC, the hugely popular Castle Combe Autumn Classic and the Annual BDC meeting at Silverstone. In conjunction with the ‘Team Captains’ of the various marques, we have drawn up a list of ‘eligible cars’. 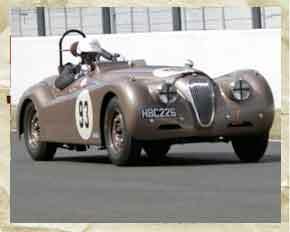 Go to the "Series Info/eligible cars" section to see the list, or to "Join Us" for a membership application form.